Albert Bartholomé, Dans la serre (1881), a portrait of his first wife Prospérie. Musée d’Orsay, Paris, on loan to the Impressionism, Fashion & Modernity exhibit currently at the Art Institute of Chicago. This painting, called Dans la Serre (In the Conservatory) is getting a lot of well-deserved attention in the Impressionism, Fashion and Modernity Exhibit currently on display at the Art Institute of Chicago (June-September 22, 2013). In spite of the snippy things the New York Times had to say about it (“wide miss” and “cloying”), in my experience, this painting draws some of the biggest crowds at the exhibit, from Paris to Chicago. Behind it lies a tragic but fascinating story. Albert Bartholomé (1848-1928) painted this portrait of his first wife Prospérie de Fleury (the daughter of the Marquis de Fleury) in 1881. She posed in a fashionable dress in the conservatory of their home, which was located at 8 rue Bayard in Paris. The dress of Prospérie Bartholomé, Musée d’Orsay. The painting is large and captivating, but when exhibited right next to the very dress that Propérie (“Périe”) wore while she posed, it’s a show stopper. The detailing of the dress is as remarkable as its petite size. Seriously, I think I could have worn that dress in sixth grade. 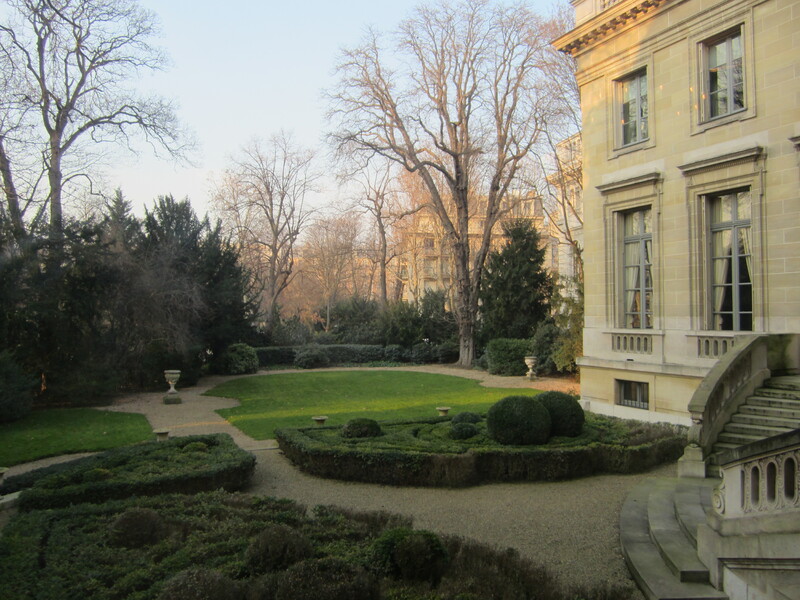 Backyard gardens of the Musée Nissim de Camondo in Paris. 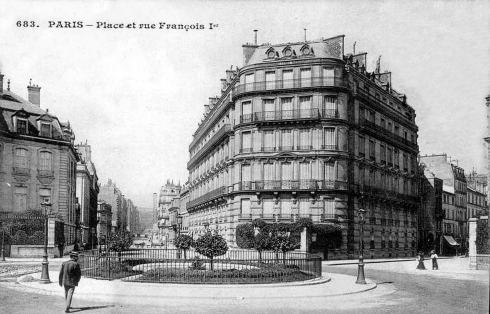 Place François 1er before 1909, source: wikipedia. 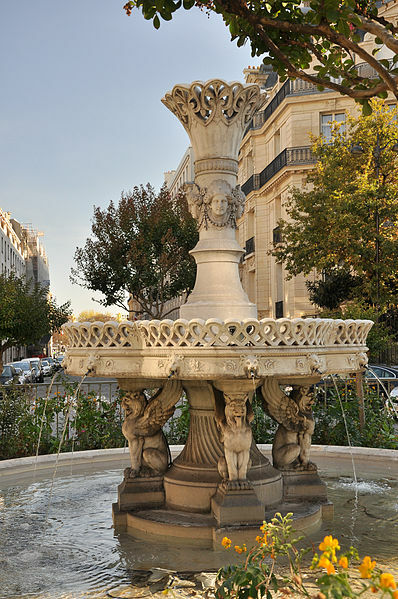 And here is the Place de François de 1er now, including the beautiful fountain you might recognize from the opening montage in Midnight in Paris. The Google Map Street View will give you a good glimpse of the structure that stands at 8 rue Bayard today. According to the Musée d’Orsay, the Bartholomés enjoyed hosting salons for their artistic circle of friends (including Edgar Degas, Mary Cassatt and Jacques-Emile Blanche) with free-ranging intellectual discussions about music, painting and books. Two years after he painted Périe’s portrait in Dans le Serre, Bartholomé drew a pastel portrait showing her reading on the couch in front of a bookshelf. Clearly, their home was full of books. Périe is dressed in another fashionable dress, this one with black ruffles and resembling some of the other fashions in the Impressionism and Fashion exhibit, particularly Manet’s Parisienne. She seems to be wearing the same gold bracelet that she did in Dans le Serre. 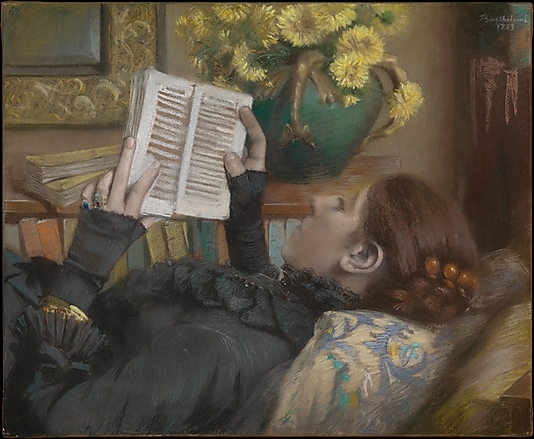 Albert Bartholomé, The Artist’s Wife, Reading, pastel and charcoal (1883), The Metropolitan Museum of Art, Catharine Lorillard Wolfe Collection. Two years later, Albert and Périe became the subject of a joint portrait by Edgar Degas, a painting started in 1885 called The Conversation. Once again, Périe’s outfit (in which her bustle resembles the tail plume of a turkey) seems to be the focus of the composition. 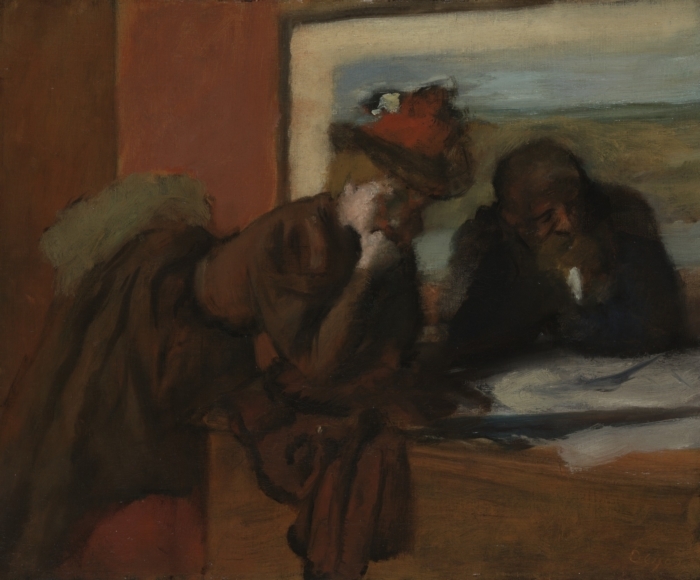 Edgar Degas, The Conversation (1885-1895), Yale University Art Gallery, Collection of Mr. and Mrs. Paul Mellon. Image: Yale Art Gallery e-catalogue. Unfortunately, Prospérie was in poor health and would die in 1887, just two years after they posed for the Degas painting. Bartholomé was so overwhelmed with grief that he preserved the dress that Périe wore in the Dans le Serre. I’m not sure how it became the property of the Charles and André Bailly Gallery in Paris, but it was subsequently gifted to the Musée d’Orsay in 1991. As if the Bartholomé story wasn’t sad enough, Périe’s death caused Albert to give up painting altogether. On the advice of his friend Edgar Degas, he took up sculpting instead. Maybe the highly physical act of molding large-scale plaster and bronze was more cathartic than painting with a brush. His first sculpture was for his wife’s tomb in front of a church in Bouillant, France, near Crépy en Valois. Not only did Bartholomé express his own raw grief, he also captured his young wife’s likeness. She has the same delicately pointed nose that she does in the painting Dans la Serre. Bartholomé’s sculpture for his first wife’s tomb in Bouillant, France. Image: Parismyope.blogspot.com. From that point on, Bartholomé’s entire oeuvre consisted of grief sculptures. 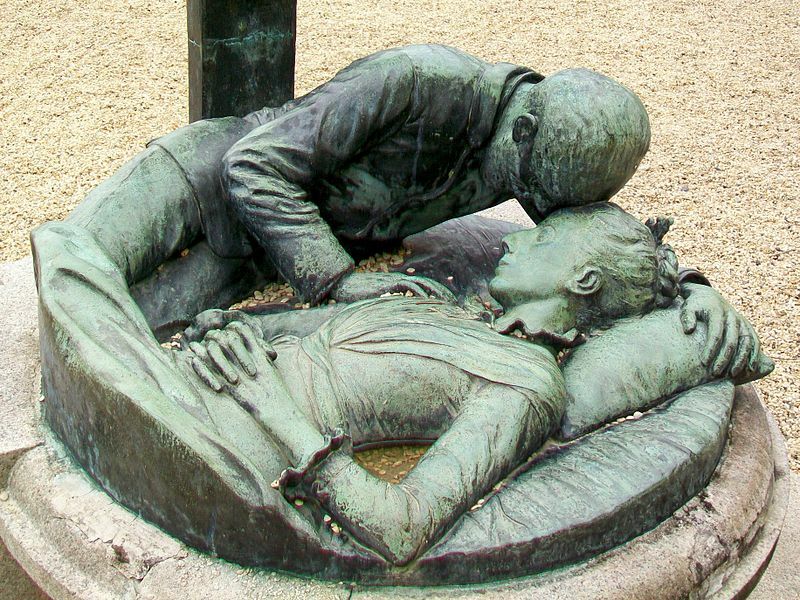 He is probably best known for his Monument aux Morts at the Pere Lachaise Cemetery in Paris (1888-1889), which is heart wrenchingly sad. 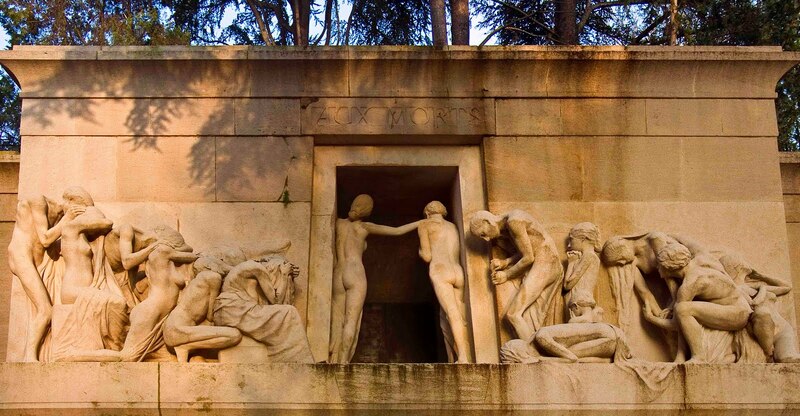 Albert Bartholomé, Monuement aux Morts du cimetière du Père Lachaise (1889-1899). Image: parismyope.blogspot. com. Despite Bartholomé’s deep and long-lasting grief, he did manage to remarry in 1901. I wish I knew the whole story, but all I can find is that his second wife Florence Letessier (18xx-1959) had been a model before their marriage, so presumably that’s how they met. Bartholomé would have been in his 50s at the time of his second marriage but Florence was much younger. Bartholomé sculpted Florence in 1909, but it doesn’t look as though her youth and serenity captured his imagination as much as the memory of his first wife. Florence’s face looks full and healthy but her expression and posture are utterly bland. Sometime after their marriage, Bartholomé and Florence moved to 1 rue Raffet in the 16th arrondissement of Paris, where he would have a sculpting studio right next door to their home. The home and studio are still standing, as you can see from Google Maps Street View. Today, the studio at 1 bis rue Raffet rents out separately from the apartment building next door. On a side note, Bartholomé’s art studio on rue Raffet became part of a huge art controversy in the 1950s. Apparently, Degas allowed his good friend Bartholomé to make plaster casts of some of his sculptures for Bartholomé’s private collection, including a plaster cast of Little Dancer, Age 14. 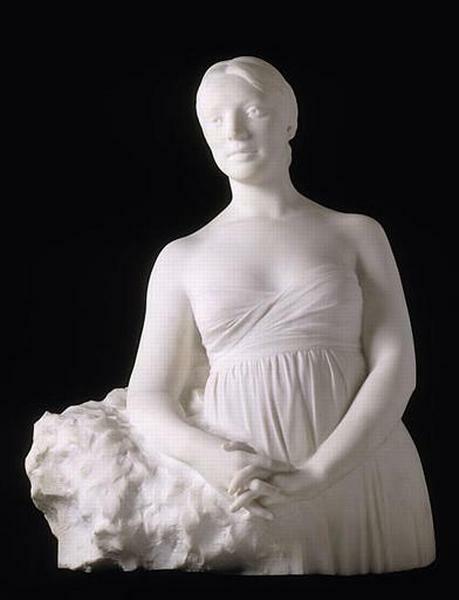 Florence inherited the plaster casts in upon Albert’s death in 1928, but they didn’t go on the art market until she was placed in an asylum in the 1950’s, creating a big controversy. In any event, you shouldn’t miss the chance to go see Bartholomé’s portrait of his wife Périe in Dans le Serre at the Art Institute of Chicago’s Impressionism, Fashion and Modernity Exhibit. Just look into Périe’s eyes, and you can almost imagine their sad story. It’s anything but a wide miss.